LAS VEGAS (July 9, 2015) –World Series of Fighting (WSOF.com) will return to Phoenix, Ariz., where it delivered one of its most memorable nights of Mixed Martial Arts (MMA) action to date earlier this year, with a world championship doubleheader headlined by a highly-anticipated rematch between undefeated, reigning WSOF World Lightweight (155 pounds) Champion Justin “The Highlight” Gaethje and hard-hitting challenger Luis “Baboon” Palomino at Comerica Theatre on Friday, Sept. 18, live on NBCSN. In the co-main event, David Branch will attempt to become the promotion’s first two-division champion and first world light heavyweight (205 pounds) champion in history when he squares off with determined, hard-hitting KO artist Teddy Holder in the championship round of the four-man, multi-event tournament that kicked off at Comerica Theatre on March 28 as part of WSOF 19. Priced from $39.99, tickets for “WSOF 23: Gaethje vs. Palomino II” go on sale on Saturday, July 11 at 10 a.m. MT and will be available for purchase at the Comerica Theatre box office and online at Ticketmaster.com. 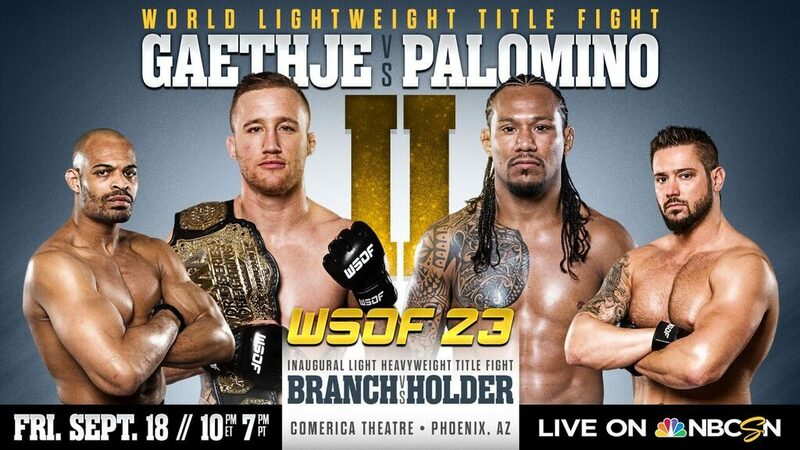 “We are excited to return to Phoenix where we witnessed one of the most incredible fights in WSOF history earlier this year between Justin Gaethje and Luis Palomino, and to see them do it all over again,” said WSOF President Ray Sefo. The ferocious, 26-year-old Gaethje (14-0) of Safford, Ariz. put forth the gutsiest performance of his four-year professional career, thus far, when he faced off with Palomino, a 34-year-old resident of Miami, Fla. known for his devastating KO power, in the main event of WSOF 19. An electric, seesaw battle that repeatedly brought the crowd on hand to its feet, suddenly ended when Gaethje, after digging down deep, put together a combination of leg kicks and punches that put the tenacious Palomino down in the third round of action and prompted the referee to call off the fight, giving Gaethje the TKO win at the 3:57 mark of the third stanza. Branch and Holder find themselves in championship round action in the WSOF tournament that kicked off in Phoenix on March 28, after both fighters faced unexpected, last-minute adversaries in the semifinal stage. Originally slated to square off with Ronny Markes, the 33-year-old Branch (16-3), the reigning WSOF world middleweight (185 pounds) champion and a Renzo Gracie Brazilian Jiu-Jitsu black belt who hails from Brooklyn, N.Y., found himself with a new opponent in Jesse McElligott just 24 hours before fight time on April 10, after a dehydrated Markes was forced to withdraw from the affair. Branch, who seized the WSOF middleweight strap with a first round (1:41) submission (d’arce choke) of Jesse Taylor on June 21, 2014, handled McElligott relatively easily, submitting him with a shoulder choke in the second round (1:28) of battle to notch his sixth consecutive win. Holder (9-1) of Bartlett, Tenn. experienced a stroke of luck when, just hours before the 29-year-old was slated to enter the cage for a WSOF 19 preliminary bout, one of the original tournament participants, Matt Hamill, withdrew from his semifinal stage matchup with seasoned star Thiago Silva, and Holder was asked to replace him. With a fraction of the professional experience of his new opponent, the heavy-handed Holder charged forward, eventually blasting Silva with a storm of punches that crumbled the Brazil native in the first round (2:00) and earned Holder a trip to the tournament’s championship round. The live NBCSN telecast of “WSOF 23: Gaethje vs. Palomino II” begins at 7:00 p.m. ET/4 p.m. PT on Friday, September 18. Doors at Comerica Theatre will open for WSOF 23 at 3:00 p.m. MT and the first preliminary card bout will begin at 3:45 p.m.
Additional bouts for the event will be announced soon.